Here's a picture of me with three of my best friends. Wait a minute. Actually, this is a picture of me with my three friends. Pete's on the left. Anna (one of his daughters) is standing behind him. Pete works (if you can call it that) as a mechanical engineer for the Smithsonian Astrophysical Observatory as a M.E. He designs telescope stuff. I'm sitting between Pete and Claude (I'm the intelligent looking one). 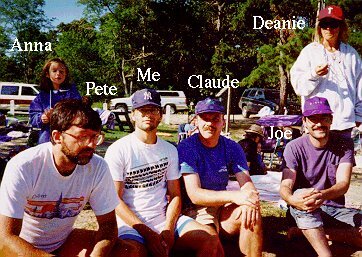 Deanie (my then wife) is standing behind Joe, eating something. Claude's third from the left. He used to work for Millipore. They make some sort of water filters for scientists. Claude was the video guy, but became the web guy. Claude left Millipore to go work for some software company doing their web based marketing, but he recently left there to go work for Joe at Joe's new company (which is no longer a secret). Joe's on the right, and is my best friend. He used to work for Avid. They make Macintosh/PC based non-linear video editing systems. I got him his job there, so he really owes me a large chunk of the money that he made when he went public. Not surprisingly, he doesn't see it that way. I think he looked better with that bicycle seat growing out of his head. He's a software guy and general high level technical person. Joe had a company he started in Acton, MA. and sold it to Intuit for a lot of $$$. It's the "Quickbase" product. I'll put a link to our college fraternity (No. 6 Club) here (we all went to college together and lived at the same fraternity). Here's a couple of pictures from our one-week long vacation with friends in Wellfleet (on Cape Cod) the last week of August, 1996. Joe (and his wife Jude, along with their three kids) rented a house in Eastham at the same time. Next year (1997, for those of you who are time-impaired) will be renting two (or possibly three) houses right next to each other in the Wellfleet Woods area of Wellfleet. 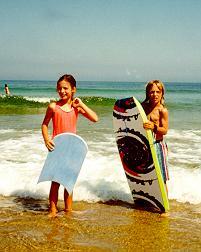 Zachary (with his [then] new boogie board - $50 new) and Anna one the beach at Newcomb Hollow in Wellfleet, MA. Good surf. 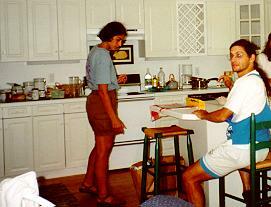 Me and Karen (Anna's mother) in the kitchen. Very exciting, eh?